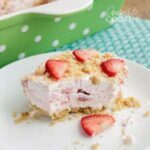 A delicious strawberry cream cheese dessert, perfect for potlucks and BBQ's! Melt butter in the microwave and allow to cool. Combine the crumbs and butter and toss together until incorporated. Press 2 cups of the crumb mixture firmly into an 9×9 square pan and bake for 8-10 minutes. Place on wire rack to cool. Reserve remaining crumbs for topping. Place strawberries in a blender or food processor and pulse a few times just to break them into chunks. Beat the cream cheese and butter together until creamy. Turn the mixer down to low and add the powdered sugar one cup at a time until incorporated. Turn up and beat well for a minute or so. Add a heaping tablespoon of the strawberry chunks and stir in with a rubber spatula. Spread the cream cheese and strawberry mixture over the crust. Fold the remaining strawberry chunks into the Cool Whip and spread on top of the cream cheese mixture. Sprinkle graham cracker crumb mixture on top (you may not use it all). This recipe for Strawberry Dream Dessert was printed from AmandasCookin.com - https://amandascookin.com/strawberry-dream-dessert/ and can only be printed for education or personal use.